A few lucky audiences have seen the new print of Orson Welles's history-play mashup, The Chimes at Midnight. It's Welles's greatest film, better than Citizen Kane—Welles thought so himself—and the print's high quality is clear from a clip of the climax (2 Henry IV 5.5) that Mr. Bongo has posted on YouTube. We can hope that a new (Criterion?) DVD will be released in U.S., so we can throw away our Brazilian bootlegs. 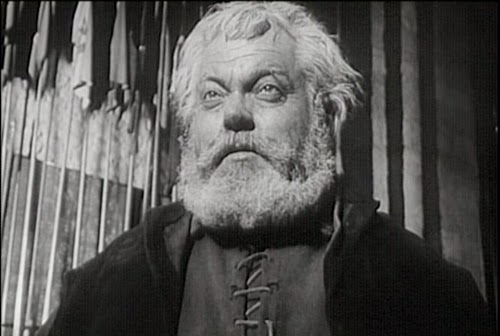 For my observations on Welles's handling of soliloquies in Chimes, click here.